male-female slip connectors. High strength steel offers increased buckling resistance compared to others. A friction reduction collar can be added to the pile to increase penetration depth. Sections are available in bare steel, epoxy powder coated, and galvanized. Galvanized coating extends average life expectancy to over 100 years even in highly corrosive environments. Custom lengths are available upon request. See Magnum? Technical Manual for additional information. *Note 1: Structural capacity is based on buckling strength of shaft in firm soils with pinned head conditions after 75 years corrosion for bare steel per ICC-ES AC358. 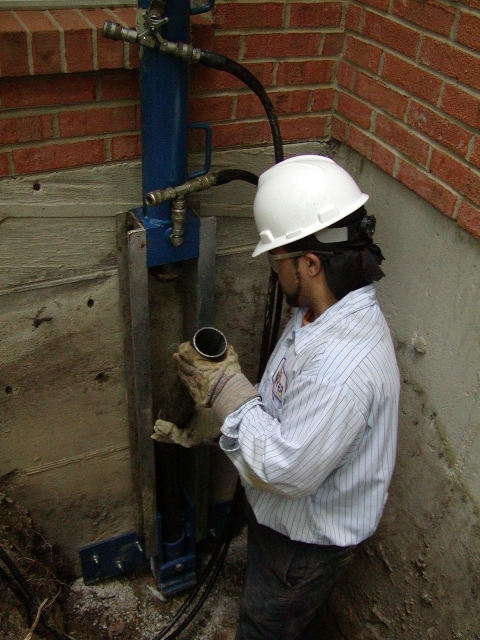 Push piers shall be installed to appropriate depth into suitable bearing stratum as determined by geotechnical engineer or local practice. For tension capacity, push pier sections must be welded together or a reinforcing steel bar and grout must be placed in the pile. **Note 2: Push pier capacity is determined by load test using Magnum installation rams or lifting kit. All push piers shall be load tested to 1.5 times the desired working load. Test load is limited by maximum safe operating ram pressure or buckling capacity of shaft, whichever is less. All Magnum Steel & Products Made in U.S.A.
U.S. Patents 6,058,662 and 5,234,287; Other Patents Pending. NOTE: Many items made to order. Bulk discounts available. Contact Magnum representative regarding price and availability. HSS 4.50" x 0.31" Wall ASTM A513 Grade 65 KSI, or Equiv. 15.9 in(2) Piston Area 7, 500 Maximum P.S.I.